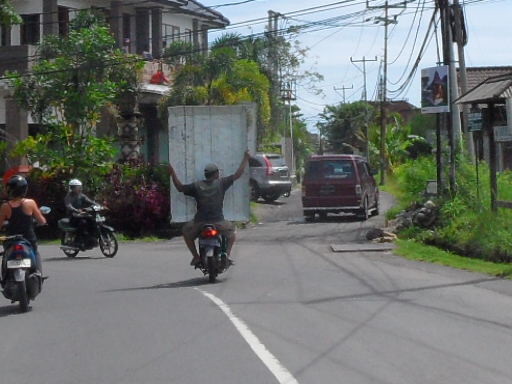 Bodging my way round Bali. Ok. Im still here!! 22 days and counting! 3rd Day..Hotel still in tact. OK, so i never thought i would last this long!! My friend is still here and still showing me ‘the ropes’ as it were. Lots to write about about, i simply havent had the time to write anything. Just getting used to my enviroment, learning the language and still trying to stay safe on the bike! Just a quick one on this… I mentioned earlier that i had been riding bikes/mopeds since i was 15/16 etc. Well this is nothing here. These guys literally grow up on peds! I see kids as young as 7- 9 riding out here and kids as soon as they can stand are on the front of a ped without a helmet! Its second nature to them and they are good riders. I find its the ex-pats that take most of the risks and nearly cause most of the accidents! Ok, more later. New place, places ive eaten, places ive drank and got drunk, clubs ive seen and Yoga!